Another #STWM for Batman…for the final time. Monday tunes! Music that mentally pushes Batman while training for races! It was only going to be the one time. I didn’t look beyond last October 20th, the day I completed my first full marathon but with a superhero twist – dressed as Batman for the entire 42.2k distance. I mean yes, I knew I was going to run another marathon – the exhilaration I felt was truly amazing (aside from the pain, which made it an even better experience for me – I like making things hard on myself). To do so again in a costume which consisted of light running compression gear, a cape and a rubber cowl (yup, it was kind of warm under there) was just going to feel like a gimmick to me. I don’t run to seek attention; I run because it transformed me, it gave me something to strive towards, to aspire to. It gave me an example to set for my kids, whether they knew it then or not—the example that even though life is always going to throw things your way, it’s how you handle it that defines who you are. 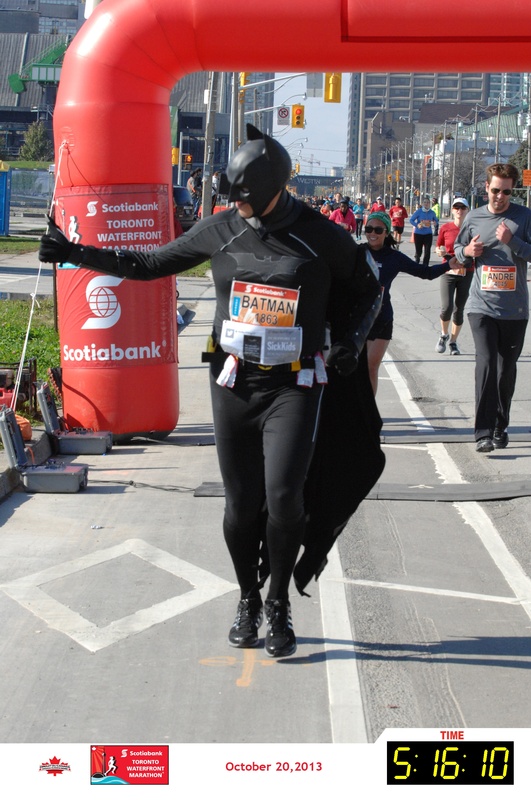 I ran the 2013 STWM as Batman because I was inspired by the heroes who fight every day for their lives at the Hospital for Sick Children, and to also say thank you to the Hospital for saving my life in an emergency one night over 30 years ago. To train is something every runner knows is crucial and vital to the outcome of their race. Much like Batman, I prepared for the grueling road ahead, to expect the unexpected and to be prepared for it both mentally and physically. I wasn’t going to just be a guy who went out and bought a costume – I was going to forge my entire body into a vessel that would carry me over a distance of 42.2k. Since nothing has ever come easy for me in life, I was going to earn the mantle of the Bat. And in the end, after a grueling 18-week marathon clinic, where I also grew mentally stronger with each training run (speed work, hills, tempos, etc. ), I knew I could answer the question “Why run as Batman?” Because I knew that I could, that I believed in myself, and because I earned it. I then ran the full, and enjoyed one of the best days of my life enduring the marathon. It was one of the greatest feelings I’ve ever felt while crossing something off my bucket list. her face. And suddenly, without any warning, I was pacing this amazing woman; when I ran, she ran. When I walked, she walked. If I took a break at a water station, she would, too. It was around the turn around in the Beaches area that we got separated, but that the sight of Batman, struggling along yet not willing to give in, got her back on track. I’m the last person who wants to take credit for something like this, and while I am grateful for Marina’s kind words (we became Facebook friends after all), I want to say this: it could be anyone in a Bat suit running and inspiring others. That is the purpose of Batman – he’s a symbol; Batman could be anyone. Soon after, I received some Twitter messages about putting together a team for a future race. My reaction was more “yeah, right!” than “yes, sign me up!” I mean – really? Before I could even say “Holy Facebook page, Batman!”, there it was – the official page of the ‘Justice League Runners’ was up and running. Suddenly it occurred to me that the world needed the symbols of these heroes, and I’m not referring to myself in general; it was the symbol of what the logo represented – Superman (hope), Batman (justice), Wonder Woman (empowerment) – these are what people in today’s age needed to believe in again, men and woman, boys and girls – all of humanity. I believe it is very, very important that we, as a society, have a hero we believe in, a symbol to shine a light for us in our darkest hour. Be it spiritually or through another medium, we need something to believe in, to draw strength from, and to have hope in. That’s why I choose to continue to run and raise funds for charity as Batman – so that people don’t see my face, but rather the symbol of the hero, doing what he can to help world be just a little better than it is now. There’s a hero in all of us – we just have to tap into our hearts and discover it. Passing the half way point & saying hello to the wonderful and supportive crowd! I spent nearly a year of my life in Sick Kids Hospital. They were wonderful. They did everything they could for me and my rather anguished parents. With my utmost sincerity, thank you for your fundraising efforts and congratulations on your race. I hope no child ever has to go through what I did, but if they do, I am glad Sick Kids and good people like you are there to help. Thanks so much for your kind words, Mike. It was a real pleasure to not only have you join us, but for you to want to be apart of our team. I am not only glad to call you JLR alumni, but a friend. You being a Digital Champion is so important; I can’t stress enough how much fun it is to be a face for a specific run that’s organized by the Canada Running Series. You certainly epitomized what it means to be a ‘champion’, my friend. Thank you again!